Originally published on the Children's Specialized Hospital Blog. I get a call from the on-call resident that our patient doesn’t “look right.” And of course it’s 2:30 a.m. and he has been destat-ing all d ay. At just under five pounds and with a vent – it’s critical that I see him, right away. Instead of getting dressed; driving into the hospital – I can now just hop on my computer and drive a robot, called VGo, around the unit to assess the patient bedside – pictured here. What is it? Essentially VGo, is a robot that allows physicians to interact with their patients at any hour without physically being in the hospital. This new technology has endless opportunities to help children with special needs and complex medical conditions that are treated here at Children’s Specialized Hospital. VGo is secure wireless connected device that enables a person to be “present” through two- way video, audio and motor driven action. We control VGo using a computer or iPad. The low profile robot on wheels moves throughout the unit and easily into a patient’s room to view vitals or have a two way conversation with the parents and address any concerns. Our inpatient medical team treats very medically fragile children rehabilitate after a brain injury, spinal cord injury, complications from prematurity and other life changing injury or illness. Their average length of stay is 6-8 weeks. There are measurable outcomes about how VGo can improve patient care and patient experience – with having it in house just over three months we are already seeing those benefits to our patients and families. Patient satisfaction and the standard of care are increased, while reducing the overall cost of care and hospital re-admissions. Telemedicine is transforming the way we provide health care, and we are fortunate Children’s Specialized Hospital is the first pediatric rehabilitation hospital in the country to offer this innovative tool to improve patient care and communication between health care providers and our patients and their family. It provides our physicians critical contact, at any time, to ensure continuity of care for children with complex conditions. With one currently residing within the New Brunswick 60-bed inpatient rehabilitation hospital, and one at each of the hospital’s two long term care centers - we hope to expand its reach and improve access to pediatric specialists and outpatient care to children living in medically underserved communities. With 12 current locations across New Jersey; a patient in Egg Harbor Township can consult with a neuro-developmental pediatrician in Clifton, 250 miles away. All in real time, all on secure networks and all compliant with federal patient privacy regulations. 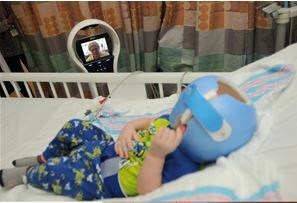 We have just begun to explore the benefits and capabilities of using telemedicine at Children's Specialized.